This tour takes place on the world famous Tazlina and Copper Rivers. There will be stops along the way that will allow for a light snack break and photo opportunities. Take in the mountainous surroundings and look for bald eagles and other wildlife in the surrounding area. 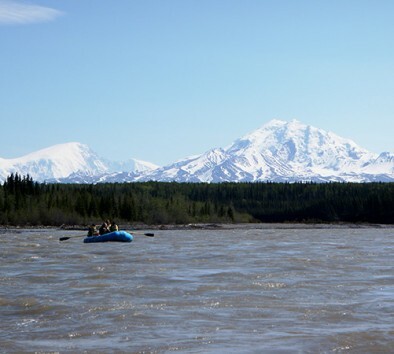 Step foot into the Wrangell St. Elias National Park and float by established fish wheels surrounded by the view of the major peaks of the volcanic Wrangell Mountains. Your professional guide will share stories, explain the history of the area that gives you some insight toward the geological past that shaped the vast Copper River Basin. Your tour will end right at a fish wheel camp so you can get an up-close view of the vitally important piece of equipment used by the locals. Maximum weight is 300 lbs. Dress in warm layers. Rain gear, boots and life jackets will be provided. Pregnant women or guests with heart or mobility problems are not allowed to participate. Wildlife sightings are likely but not guaranteed.